Luigi Boccherini was born in the Tuscan city of Lucca in 1743 and, after studying in Rome and spending time in Vienna, he visited Madrid for the first time in 1769. After living in Spain for less than a year he was appointed cellist and composer to the Infante, Don Luis, the younger brother of King Charles III. It was at about this time that many of Boccherini’s sonatas for cello were published in London, including the one in A major which contains the Allegro moderato that was a favourite encore of Casals’. Although Boccherini’s cello sonatas appear in contemporary manuscripts in just two parts, the solo cello joined by an unspecified ‘basso’ string instrument (either a second cello or a double bass), many were later published with (anonymously arranged) keyboard accompaniments. Frédéric Chopin composed his three Nocturnes Op 9 between 1830 and 1832. Casals frequently played the second of these, the famous Nocturne in E flat major, as an encore in the highly idiomatic arrangement by the influencial cellist and composer David Popper, who became the leader of the Hungarian cello school while teaching at the Conservatory at Budapest. Many of Chopin’s twenty-four Preludes, Op 28, were composed at Valldemosa during an ill-fated holiday on the island of Majorca with George Sand in the winter of 1838–9. In her recollections of that holiday, Sand maintained that it was the sound of rain pounding on the roof that had inspired Chopin to compose the fifteenth of these Preludes, which became known as the ‘Raindrop’. This arrangement is more literal than Popper’s transcription of the Nocturne, with effective use of double stopping. Four years before Chopin died, Richard Wagner’s Tannhäuser received its first performance in Dresden. Wagner wrote both words and music for this opera, completing the libretto in April 1843 and the score during the spring of 1845. In his Act 3 song To the Evening Star (‘O du, mein holder Abendstern’), Wolfram von Eschenbach sings secretly of his love for Elisabeth, who is eagerly awaiting the return of Tannhäuser with whom she herself has long been in love. This arrangement for cello and piano was made by the German-American cellist Leo Schulz (1865–1944). Eduard Lassen was born in Copenhagen in 1830 but was taken as an infant to Brussels where, at the age of only twelve, he enrolled at the Conservatory. In 1851 he won the Belgian Prix de Rome which enabled him to further his studies in both Germany and Italy, and, in Rome itself, to meet and become friends with Liszt. Lassen was later to succeed Liszt as Court Music Director at Weimar, a post he held until his retirement in 1895. As a composer, he was particularly known for his songs. Mit deinen blauen Augen (‘With your blue eyes’) is the fifth of five songs that Lassen dedicated to Duke Ernest of Saxe-Coburg-Gotha, the brother-in-law of Queen Victoria. Camille Saint-Säens, who travelled to Weimar in 1877 to attend a production of his opera Samson et Dalila conducted by Lassen, composed his Allegro appassionato Op 43 for cello and piano or orchestra in 1873 and dedicated it to the French cellist Jules Lasserre. Le Cygne (‘The Swan’), composed for the elderly cellist Charles Joseph Lebouc, formed part of Le Carnaval des animaux, the grand zoological fantasy Saint-Säens wrote in 1886 to entertain his friends but not his public; during his lifetime, only Le Cygne appeared in print, the complete work not being performed until 25 February 1922, some two months after the composer’s death. Another young musician to benefit from the encouragement of Liszt was Giovanni Sgambati. Born in Rome in 1841, Sgambati began playing the piano at the age of five. He first met Liszt in 1862 and before long had become both his pupil and friend. The two travelled to Germany in 1869 and there Sgambati first encountered the music of Wagner and, indeed, the man himself. So impressed was Wagner with Sgambati’s compositions that he immediately recommended them to his own publisher, Schott. The Serenata napoletana is the second of two pieces Op 24, originally composed for violin and piano and here transposed down an octave. ‘Whatever people’s opinion of David Popper’, declared Pablo Casals, ‘I will play his music as long as I play the cello, for no other composer wrote better for the instrument.’ Popper was born in Prague in 1843 and, as a child, learnt to play the piano and violin. However, when he went to study at the Prague Conservatory at the age of twelve, he was persuaded to take up the cello instead as there was a shortage of cellists in the city at that time. Popper became an internationally renowned virtuoso, and also composed many pieces for his instrument. One of the most popular, the Mazurka in G minor Op 11 No 3, he dedicated to Bernhard Cossmann who, like Leo Schulz, had been leader of the cello section of the Leipzig Gewandhaus Orchestra. In 1912 Popper heard Casals play this Mazurka as an encore at a concert which had also included his effervescent Chanson villageoise. Vito, from the Spanish Dances Op 54, was another of Popper’s pieces often performed by Casals, its unassuming opening giving way to more virtuoso writing, including tremolando double stopping and running passagework high on the A string. Gabriel Fauré composed songs throughout his long career, Après un rêve first appearing in print in 1878 as Op 7 No 1. Unfolding a seamless flowering of melodic invention, in Casals’ instantly famous arrangement from 1910 this becomes a glorious song without words. In 1888 Edward Elgar composed a short piece originally called Liebesgruß (‘Love’s greeting’), to which he added a dedication ‘à Carice’—a contraction of the Christian names of his then fiancée Caroline Alice Roberts and also the name the couple later gave to their only daughter. The piece was published by Schott the following year, in versions for violin and piano, piano solo, cello and piano, and for small orchestra. Schott soon changed the title to Salut d’amour, with ‘Liebesgruß’ as a subtitle, whereupon it became one of the composer’s most popular, and most widely arranged, works. The Romanze Op 35 by Edward MacDowell, dedicated to David Popper, was also composed in 1888. Having failed to gain a post at the Royal Academy of Music in London—not only because he was considered too young but also because of his friendship with Liszt, who was considered too ‘modern’—MacDowell and his wife bought a cottage in the woods not far from Wiesbaden in which he was able to devote himself to composition. During this period, before returning with his wife to the USA, he completed several songs and piano pieces, two orchestral tone poems, his Second Piano Concerto, and this beautiful Romanze which is marked by a touching lyrical simplicity. For a time MacDowell studied in Paris with Antoine-François Marmontel, whose piano pupils at that time also included Claude Debussy. By 1880 Debussy had also begun to study composition at the Conservatoire and, within four years, had won the Prix de Rome. In 1889 he completed his Petite Suite, a four-movement work for piano duet which was subsequently orchestrated by Henri Büsser. Recorded here is an arrangement by Gaston Choisnel (1857–1921) for cello and piano of the Menuet, the Suite’s third movement. Enrique Granados first studied music in Barcelona, to the east of his home town of Lérida. Later he spent two years in Paris as a piano pupil of Charles de Bériot before giving his first recital back in Barcelona in 1890. As well as being a pianist and composer, Granados was an accomplished painter with an overwhelming admiration for Goya. This love of Goya’s paintings led him to attempt to translate them into music, firstly in pieces for the piano and then as an opera, both of which he entitled Goyescas. (It was after attending the first performance of the opera, at the Metropolitan Opera in New York on 26 January 1916, that the ship bringing him home was torpedoed by a German submarine killing both Granados his wife.) The Danza española entitled Andaluza, the fifth in a set of twelve such Spanish dances for solo piano that form his Op 37, is one of the composer’s most famous pieces—widely arranged for solo guitar, violin and piano, and cello and piano. In about 1910 Fritz Kreisler announced to the American press that ‘the king of the bow has arrived’, the bow in question belonging to Pablo Casals. Before long Kreisler had joined Casals and the pianist Harold Bauer in a trio which was to excel both in chamber music and performances of Beethoven’s ‘Triple’ Concerto. Kreisler was born in Vienna in 1875, studied at the Conservatoires both in his native city and in Paris, became a French citizen in 1938, an American citizen in 1943, and was the most famous violinist of his time. Early in his career, he started composing short pieces for his own recital use but, imagining that they would receive scant attention and practically no critical acclaim if his own name were attached to them, described them either as arrangements of folk songs or as transcriptions of works by long-dead composers such as Vivaldi, Rameau, Martini and Pugnani. Included amongst these are the Chanson Louis XIII and Pavane composed ‘in the style of’ Couperin. It is heard here transposed down an octave. In 1907 Manuel de Falla moved from Spain to Paris, where he lived for the next seven years. He was befriended by Dukas, Ravel and Debussy and had a great success with La vida breve. Following the first performance of this opera, Falla was asked by a member of the cast—a singer from Málaga—to suggest some Spanish songs that she could include in a concert she was soon to give in the French capital. He set about composing Siete canciones populares españolas, the fifth of which is an Andalusian lullaby (or berceuse) entitled Nana. Casals performed this in the faithful arrangement by Maurice Maréchal, which we also hear on this recording. While Pablo Casals had a considerable repertoire of encores from which to choose, there was one piece that he would always play. As he once explained: ‘I began the custom of concluding my concerts with the melody of an old Catalan carol, The Song of the Birds [‘El cant dels ocells’] cl. It is a tale of the Nativity; how beautiful and tender is that tale, with its reverence for life and for man, the noblest expression of life! In the Catalan carol it is the eagles and the sparrows, the nightingales and the little wrens who sing a welcome to the infant, singing to him as a flower that will delight the earth with its sweet scent’. Luigi Boccherini est né à Lucques, en Toscane, en 1743 et, après avoir fait ses études à Rome et séjourné à Vienne, il s’est rendu à Madrid pour la première fois en 1769. Il vivait en Espagne depuis moins d’un an lorsqu’il a été nommé violoncelliste et compositeur de l’Infant, Don Luis, frère cadet du roi Charles III. C’est à peu près à cette époque qu’ont été publiées à Londres un certain nombre de sonates pour violoncelle de Boccherini, notamment celle en la majeur dont l’Allegro moderato était un bis favori de Casals. Si les sonates pour violoncelle de Boccherini paraissent dans les manuscrits de l’époque juste en deux parties, le violoncelle solo rejoint par un instrument à cordes «basso» non spécifié (soit un second violoncelle, soit une contrebasse), plusieurs d’entre elles ont été par la suite publiées avec des accompagnements d’instruments à clavier (dans des arrangements anonymes). Frédéric Chopin a composé ses trois Nocturnes, op. 9, entre 1830 et 1832. Casals a souvent joué en bis le deuxième, le célèbre Nocturne en mi bémol majeur, dans un arrangement très idiomatique de David Popper, violoncelliste et compositeur influent, qui est devenu le chef de file de l’école hongroise de violoncelle lorsqu’il enseignait au Conservatoire de Budapest. Un grand nombre des vingt-quatre Préludes, op. 28, de Chopin ont été composés à Valldemosa au cours de vacances malheureuses à Majorque avec George Sand durant l’hiver 1838–1839. Dans ses souvenirs de ces vacances, Sand a affirmé que c’était le bruit de la pluie battante sur le toit qui avait inspiré à Chopin la composition du quinzième de ces préludes, qui a fini par s’appeler «la goutte d’eau». Cet arrangement est plus littéral que la transcription que Popper a faite du nocturne, avec un usage efficace des doubles cordes. Quatre ans avant la mort de Chopin, Tannhäuser de Richard Wagner a été créé à Dresde. Wagner a écrit le texte et la musique de cet opéra, achevant le livret en avril 1843 et la partition au cours du printemps 1845. Dans l’air de l’acte III, la Romance à l’étoile («O du, mein holder Abendstern»), Wolfram von Eschenbach chante en secret son amour pour Elisabeth, qui attend impatiemment le retour de Tannhäuser dont elle est amoureuse depuis longtemps. Cet arrangement pour violoncelle et piano a été réalisé par le violoncelliste germano-américain Leo Schulz (1865–1944). Eduard Lassen est né à Copenhague en 1830, mais a vécu dès son enfance à Bruxelles où il est entré au Conservatoire à l’âge de douze ans seulement. En 1851, il a remporté le Prix de Rome belge, ce qui lui a permis de poursuivre ses études en Allemagne et en Italie, et, à Rome, de rencontrer Liszt et de se lier d’amitié avec lui. Par la suite, Lassen allait lui succéder comme directeur de la musique de la cour à Weimar, poste qu’il a conservé jusqu’à sa retraite en 1895. Comme compositeur, il était surtout connu pour ses lieder. Mit deinen blauen Augen («Avec tes yeux bleus») est le dernier des cinq lieder que Lassen a dédiés au duc Ernest de Saxe-Coburg-Gotha, beau-frère de la reine Victoria. Camille Saint-Saëns, qui s’est rendu à Weimar en 1877 pour assister à une production de son opéra Samson et Dalila sous la direction de Lassen, a composé son Allegro appassionato, op. 43, pour violoncelle et piano ou orchestre en 1873 et l’a dédié au violoncelliste français Jules Lasserre. Le Cygne, composé pour le vieux violoncelliste Charles Joseph Lebouc, faisait partie du Carnaval des animaux, la grande fantaisie zoologique écrite par Saint-Saëns en 1886 pour divertir ses amis mais pas son public; de son vivant, seul Le Cygne a été publié; l’œuvre complète n’a été jouée en public que le 25 février 1922, environ deux mois après la mort du compositeur. Un autre jeune musicien, Giovanni Sgambati, a bénéficié du soutien de Liszt. Né à Rome en 1841, Sgambati a commencé à jouer du piano à l’âge de cinq ans. Il a fait la connaissance de Liszt en 1862 et est vite devenu son élève et son ami. Ils ont voyagé ensemble en Allemagne en 1869 et Sgambati y a découvert la musique de Wagner et, d’ailleurs, le compositeur en personne. Wagner a été tellement impressionné par les œuvres de Sgambati qu’il les a immédiatement recommandées à son propre éditeur, Schott. La Serenata napoletana est la seconde des deux pièces op. 24, composée à l’origine pour violon et piano et transposée ici à l’octave inférieure. «Quelle que soit l’opinion des gens sur David Popper», a déclaré Pablo Casals, «je jouerai sa musique aussi longtemps que je jouerai du violoncelle, car aucun autre compositeur n’a mieux écrit pour cet instrument». Popper est né à Prague en 1843 et, dans son enfance, il a appris à jouer du piano et du violon. Toutefois, lorsqu’il est allé faire ses études au conservatoire de Prague à l’âge de douze ans, il s’est laissé convaincre de se mettre au violoncelle car on manquait de violoncellistes dans la ville à cette époque. Popper est devenu un virtuose de renommée internationale et a en outre composé de nombreuses pièces pour son instrument. L’une des plus populaires, la Mazurka en sol mineur, op. 11 no 3, est dédiée à Bernhard Cossmann qui, comme Leo Schulz, avait été violoncelle solo de l’Orchestre du Gewandhaus de Leipzig. En 1912, Popper a entendu Casals jouer cette mazurka en bis à un concert au programme duquel figurait aussi son exubérante Chanson villageoise. Vito, des Danses espagnoles, op. 54, est une autre pièce de Popper que jouait souvent Casals, son début sans prétention faisant place à une écriture plus virtuose, notamment en doubles cordes tremolando et avec des traits rapides en haut de la corde de la. Gabriel Fauré a composé des mélodies tout au long de sa carrière; Après un rêve fut publiée en 1878 sous l’op. 7 no 1. Déployant un épanouissement continu d’invention mélodique, dans l’arrangement célèbre de Casals (1910) qui a connu d’emblée la célébrité, cette pièce devient un magnifique chant sans paroles. En 1888, Edward Elgar a composé une courte pièce intitulée à l’origine Liebesgruß («Salut d’amour»), à laquelle il a ajouté la dédicace «à Carice»—contraction des noms de baptême de sa fiancée Caroline Alice Roberts, nom que le couple a ensuite donné à sa fille unique. L’œuvre a été publiée par Schott l’année suivante, dans des versions pour violon et piano, piano seul, violoncelle et piano, et petit orchestre. Schott a vite changé le titre en Salut d’amour, avec «Liebesgruß» en sous-titre, après quoi elle est devenue l’une des œuvres les plus populaires et les plus souvent arrangées du compositeur. La Romanze, op. 35, d’Edward MacDowell, dédiée à David Popper, a également été composée en 1888. N’ayant pas réussi à obtenir un poste à la Royal Academy of Music de Londres—non seulement parce qu’il était jugé trop jeune, mais encore à cause de son amitié avec Liszt considéré «trop moderne»—, MacDowell et sa femme ont acheté une petite maison dans les bois près de Wiesbaden, où il a pu se consacrer à la composition. Durant cette période, avant de retourner aux États-Unis avec sa femme, il a terminé plusieurs mélodies et pièces pour piano, deux poèmes symphoniques pour orchestre, son Concerto pour piano no 2 et cette magnifique Romanze qui se distingue par une simplicité lyrique touchante. Pendant quelque temps, MacDowell a étudié à Paris avec Antoine-François Marmontel, un professeur de piano qui comptait alors également Claude Debussy parmi ses élèves. En 1880, Debussy avait aussi commencé à étudier la composition au Conservatoire et, en l’espace de quatre ans, il avait remporté le Prix de Rome. En 1889, il a achevé sa Petite Suite, œuvre en quatre mouvements pour piano à quatre mains qui a ensuite été orchestrée par Henri Büsser. Le troisième mouvement de la Suite, le Menuet, est enregistré ici dans un arrangement de Gaston Choisnel (1857–1921) pour violoncelle et piano. Enrique Granados a commencé ses études musicales à Barcelone, ville située à l’est de sa ville natale de Lérida. Il a ensuite passé deux ans à Paris, où il a travaillé le piano avec Charles de Bériot, avant de donner son premier récital à Barcelone en 1890. Outre ses talents de pianiste et de compositeur, Granados était un peintre accompli et portait une admiration totale à Goya, ce qui l’a poussé à essayer de traduire en musique les tableaux de ce peintre, tout d’abord dans des pièces pour piano, puis dans un opéra, tous intitulés Goyescas (c’est après avoir assisté à la première représentation de l’opéra au Metropolitan Opera de New York, le 26 janvier 1916, que le bateau qui le ramenait chez lui a été torpillé par un sous-marin allemand entraînant la mort de Granados et de sa femme). La Danza española intitulée Andaluza, la cinquième danse d’un recueil de douze danses espagnoles pour piano seul qui constituent son op. 37, est l’une des œuvres les plus célèbres du compositeur—elle a fait l’objet de nombreux arrangements pour guitare seule, violon et piano, et violoncelle et piano. Vers 1910, dans une déclaration à la presse américaine, Fritz Kreisler a annoncé «l’arrivée du roi de l’archet», l’archet en question étant celui de Pablo Casals. Kreisler s’est vite réuni avec Casals et le pianiste Harold Bauer en un trio qui allait exceller dans le domaine de la musique de chambre comme dans des exécutions du «Triple» Concerto de Beethoven. Né à Vienne en 1875, Kreisler avait fait ses études au Conservatoire de sa ville natale et au Conservatoire de Paris; il est devenu citoyen français en 1938, citoyen américain en 1943 et a été le violoniste le plus célèbre de son temps. Au début de sa carrière, il a commencé à composer de petites pièces pour ses propres récitals mais, pensant qu’on n’y prêterait guère attention et qu’elles ne susciteraient guère d’appréciations positives de la critique si son propre nom y était attaché, il les a présentées comme des arrangements de chansons traditionnelles ou des transcriptions d’œuvres de compositeurs disparus depuis longtemps tels Vivaldi, Rameau, Martini et Pugnani. Parmi ces pièces figure la Chanson Louis XIII et Pavane composée «dans le style de» Couperin. Elle est ici transposée à l’octave inférieure. En 1907, Manuel de Falla a quitté l’Espagne pour Paris, où il a vécu pendant sept ans. Il s’est lié d’amitié avec Dukas, Ravel et Debussy, et a remporté beaucoup de succès avec La vida breve («La vie brève»). Après la création de cet opéra, une chanteuse de Málaga qui faisait partie de la distribution a demandé à Falla de lui suggérer quelques mélodies espagnoles qu’elle pourrait chanter lors d’un concert qu’elle devait bientôt donner dans la capitale française. Falla s’est mis alors à composer ses Siete canciones populares españolas, dont la cinquième est une berceuse andalouse intitulée Nana. Casals l’a jouée dans un arrangement fidèle de Maurice Maréchal, repris dans cet enregistrement. Luigi Boccherini wurde 1743 in der toskanischen Stadt Lucca geboren, und nach dem Studium in Rom und einem Aufenthalt in Wien besuchte er 1769 zum ersten Mal Madrid. Nach weniger als einem Jahr in Spanien wurde er zum Cellisten und Komponisten des Infanten Don Luis ernannt, dem jüngeren Bruder von König Karl III. Etwa um diese Zeit wurden Boccherinis Sonaten für Violoncello in London veröffentlicht, unter anderem die in A-Dur, deren Allegro moderato eine von Casals’ Lieblingszugaben war. Obwohl Boccherinis Cellosonaten in den zeitgenössischen Handschriften nur zwei Stimmen aufweisen—neben dem Solocello ein nicht näher bestimmtes „Basso“-Streichinstrument (entweder ein zweites Cello oder ein Kontrabass)—, erschienen viele von ihnen später mit einer (anonym arrangierten) Tastenbegleitung. Frédéric Chopin komponierte seine Nocturnes op. 9 zwischen 1830 und 1832. Casals spielte als Zugabe oft die Nr. 2 der beiden, das berühmte Nocturne Es-Dur, in einer überaus eigenwilligen Bearbeitung des einflussreichen Cellisten und Komponisten David Popper, der in seiner Zeit als Lehrer am Budapester Konservatorium zur führenden Figur der ungarischen Celloschule wurde. Viele der 24 Préludes op. 28 von Chopin entstanden während eines vom Unglück überschatteten Urlaubs mit George Sand auf der Insel Mallorca im Winter 1838/39 in Valldemosa. In ihren Erinnerungen an diesen Urlaub behauptet Sand, dass es der auf das Dach hämmernde Regen gewesen sei, der Chopin zur Komposition von Prélude Nr. 15 inspiriert habe, dem sogenannten „Regentropfen-Prélude“. Diese Bearbeitung ist näher am Original als Poppers Transkription des Nocturnes und setzt wirkungsvoll Doppelgriffe ein. Vier Jahre vor Chopins Tod gelangte Richard Wagners Tannhäuser in Dresden zur Uraufführung. Wagner schrieb sowohl den Text als auch die Musik zu dieser Oper und schloss das Libretto im April 1843, die Partitur im Frühling 1845 ab. In seinem Lied an den Abendstern („O du, mein holder Abendstern“) aus dem dritten Akt singt Wolfram von Eschenbach heimlich von seiner Liebe zu Elisabeth, die sehnsüchtig auf die Rückkehr von Tannhäuser wartet, in den wiederum sie seit langem verliebt ist. Diese Bearbeitung für Cello und Klavier stammt von dem deutsch-amerikanischen Cellisten Leo Schulz (1865–1944). Eduard Lassen wurde 1830 in Kopenhagen geboren, kam als Kleinkind aber nach Brüssel, wo er sich mit nur zwölf Jahren am Konservatorium einschrieb. 1851 gewann er den belgischen Prix de Rome, der es ihm ermöglichte, sein Studium in Deutschland und Italien fortzusetzen und in Rom selbst mit Liszt Bekanntschaft zu machen und Freundschaft zu schließen. Später sollte Lassen Liszts Nachfolger als Hofkapellmeister in Weimar werden, eine Stellung, die er bis zu seiner Pensionierung 1895 innehatte. Als Komponist war er vor allem für seine Lieder bekannt. Mit deinen blauen Augen ist das letzte von fünf Liedern, die Lassen Herzog Ernst von Sachsen-Coburg-Gotha widmete, dem Schwager der englischen Königin Victoria. Camille Saint-Saëns, der 1877 nach Weimar reiste, um eine von Lassen dirigierte Inszenierung seiner Oper Samson et Dalila zu besuchen, schrieb sein Allegro appassionato op. 43 für Violoncello und Klavier oder Orchester 1873 und widmete es dem französischen Cellisten Jules Lasserre. Le Cygne („Der Schwan“), komponiert für den alternden Cellisten Charles Joseph Lebouc, war Teil von Le Carnaval des animaux („Der Karneval der Tiere“), jener großen zoologischen Fantasie, die Saint-Saëns 1886 zur Unterhaltung seiner Freunde, nicht aber seines Publikums schrieb; zu seinen Lebzeiten erschien nur Le Cygne im Druck, und das Werk als Ganzes wurde erst am 25. Februar 1922 aufgeführt, etwa zwei Monate nach dem Tod des Komponisten. Ein anderer junger Musiker, dem die Unterstützung Liszts zugutekam, war Giovanni Sgambati. 1841 in Rom geboren, begann Sgambati mit fünf Jahren, Klavier zu spielen. Er lernte Liszt 1862 kennen und wurde binnen kurzer Zeit ein Schüler und Freund von ihm. 1869 reisten die beiden nach Deutschland, und dort begegnete Sgambati zum ersten Mal der Musik Wagners und auch Wagner selbst. Dieser war so beeindruckt von Sgambatis Kompositionen, dass er ihn sofort an seinen eigenen Verleger Schott weiterempfahl. Die Serenata napoletana ist die Nr. 2 der beiden Stücke op. 24, ursprünglich für Geige und Klavier komponiert und hier eine Oktave nach unten transponiert. „Egal, was die Leute von David Popper halten“, erklärte Pablo Casals, „ich werde seine Musik spielen so lange ich Cello spiele, denn kein anderer Komponist hat besser für das Instrument geschrieben.“ Popper wurde 1843 in Prag geboren und lernte als Kind Klavier und Geige. Als er mit zwölf Jahren zum Studium an das Prager Konservatorium kam, ließ er sich jedoch überreden, mit dem Cellospiel zu beginnen, da in der Stadt damals ein Mangel an Cellisten herrschte. Popper wurde ein international gefeierter Virtuose und schrieb daneben zahlreiche Stücke für sein Instrument. Eines der beliebtesten, die Mazurka g-Moll op. 11 Nr. 3, widmete er Bernhard Cossmann, der wie Leo Schulz Stimmführer im Leipziger Gewandhausorchester gewesen war. 1912 hörte Popper, wie Casals diese Mazurka als Zugabe in einem Konzert spielte, bei dem außerdem seine überschäumende Chanson villageoise erklungen war. Vito aus den Spanischen Tänzen op. 54 war ein weiteres Stück von Popper, das Casals oft zu Gehör brachte und dessen zurückhaltender Anfang einer virtuoseren Gestaltung mit tremolierenden Doppelgriffen und schnellen Läufen weit oben auf der A-Seite weicht. Gabriel Faurés Liedschaffen erstreckt sich über seine gesamte, lange Laufbahn; Après un rêve war 1878 als op. 7 Nr. 1 im Druck erschien. Mit seinem ungebrochenen Fluss sprießender melodischer Erfindung wird es in Casals’ Bearbeitung von 1910, die auf Anhieb Berühmtheit erlangte, zu einem prächtigen Lied ohne Worte. 1888 komponierte Edward Elgar ein kurzes Stück, das ursprünglich den Titel Liebesgruß trug, ergänzt um die Widmung „à Carice“—ein Mischwort aus den Vornamen seiner damaligen Verlobten Caroline Alice Roberts und der Name, den das Paar später seiner einzigen Tochter gab. Das Stück wurde im Folgejahr von Schott in Fassungen für Violine und Klavier, Klavier allein, Cello und Klavier und für Kammerorchester veröffentlicht. Schott änderte den Titel kurz darauf in Salut d’amour, mit „Liebesgruß“ als Untertitel, woraufhin es zu einem der beliebtesten und meistbearbeiteten Werke des Komponisten wurde. Die Romanze op. 35 von Edward MacDowell, David Popper gewidmet, entstand ebenfalls 1888. Nachdem er sich vergeblich um einen Posten an der Royal Academy of Music in London bemüht hatte—nicht nur, weil man ihn für zu jung hielt, sondern auch aufgrund seiner Freundschaft zu Liszt, der als zu „modern“ galt—, kauften MacDowell und seine Frau ein Waldhaus unweit von Wiesbaden, in dem er sich dem Komponieren widmen konnte. In dieser Zeit, bevor er mit seiner Frau in die USA zurückkehrte, vollendete er mehrere Lieder und Klavierstücke, zwei symphonische Dichtungen, sein Klavierkonzert Nr. 2 sowie diese wunderbare Romanze, die sich durch ihre berührende lyrische Schlichtheit auszeichnet. Eine Zeit lang nahm MacDowell in Paris Unterricht bei Antoine-François Marmontel, zu dessen Klavierschülern damals auch Claude Debussy gehörte. Im Jahr 1880 hatte Debussy daneben begonnen, am Konservatorium Komposition zu studieren, und innerhalb von vier Jahren hatte er den Prix de Rome gewonnen. 1889 vollendete er seine Petite Suite, ein viersätziges Werk für Klavier zu vier Händen, das in der Folge von Henri Büsser orchestriert wurde. Hier ist der dritte Satz der Suite, das Menuet, in einer Bearbeitung für Cello und Klavier von Gaston Choisnel (1857–1921) eingespielt. Enrique Granados begann sein Musikstudium in Barcelona, östlich seines Heimatorts Lérida gelegen. Später verbrachte er zwei Jahre als Klavierschüler von Charles de Bériot in Paris, bevor er 1890 seinen ersten Klavierabend wieder in Barcelona gab. Granados war nicht nur Pianist und Komponist, sondern auch ein begabter Maler, und seine uneingeschränkte Bewunderung galt Goya. Diese Liebe zu Goyas Bildern führte ihn zu dem Versuch, sie in Musik zu übersetzen, zuerst in Form von Klavierstücken, dann als Oper, in beiden Fällen unter dem Titel Goyescas. (Nachdem er am 26. Januar 1916 die Uraufführung der Oper an der Metropolitan Opera in New York besucht hatte, wurde das Schiff, auf dem er heimreiste, von einem deutschen U-Boot torpediert, wobei er und seine Frau ums Leben kamen.) Die Danza española mit dem Titel Andaluza, Nr. 5 der zwölf spanischen Tänze für Klavier solo, die sein op. 37 bilden, ist eines der berühmtesten Stücke des Komponisten—vielfach bearbeitet für Sologitarre, Geige und Klavier sowie Cello und Klavier. Um das Jahr 1910 verkündete Fritz Kreisler vor der amerikanischen Presse, dass „der König des Bogens“ angekommen sei, und der besagte Bogen gehörte Pablo Casals. Binnen kurzem hatte sich Kreisler mit Casals und dem Pianisten Harold Bauer zu einem Trio zusammengetan, das sich sowohl in der Kammermusik als auch mit Aufführungen von Beethovens „Tripelkonzert“ hervortun sollte. Kreisler wurde 1875 in Wien geboren, studierte am Konservatorium seiner Heimatstadt und an dem von Paris, wurde 1938 französischer Staatsbürger, 1943 US-Bürger und war der berühmteste Geiger seiner Zeit. Schon früh in seiner Karriere begann er, kurze Stücke zum Gebrauch bei seinen eigenen Auftritten zu komponieren, doch da er sich ausrechnete, dass man ihnen unter seinem Namen nur wenig Beachtung und so gut wie keinerlei kritischen Beifall schenken würde, bezeichnete er sie entweder als Volksliedbearbeitungen oder als Transkriptionen von Werken längst verstorbener Komponisten wie Vivaldi, Rameau, Martini oder Pugnani. Zu diesen Stücken gehört auch die „im Stil von“ Couperin komponierte Chanson Louis XIII et Pavane. Sie erklingt hier eine Oktave nach unten transponiert. Im Jahre 1907 zog Manuel de Falla von Spanien nach Paris, wo er die nächsten sieben Jahre lebte. Dukas, Ravel und Debussy schlossen mit ihm Freundschaft, und er hatte großen Erfolg mit La vida breve. Nach der Uraufführung dieser Oper wurde Falla von einem Mitglied des Ensembles—einer Sängerin aus Málaga—gebeten, ihr einige spanische Lieder zu nennen, die sie bei einem bevorstehenden Konzert in der französischen Hauptstadt verwenden könnte. Er machte sich an die Komposition der Siete canciones populares españolas, deren Nr. 5 ein andalusisches Wiegenlied (oder Berceuse) mit dem Titel Nana ist. Casals spielte es in einer originalgetreuen Bearbeitung von Maurice Maréchal, die wir auch auf dieser Einspielung hören. My first idol was the great Spanish cellist Pablo Casals. I bought every single LP I could get my hands on, and for a long time I wanted to emulate his unique sound. I loved the intensity, the articulation, the ‘interpretative’ intonation (playing the minor thirds very low, leading notes very high, etc. ); even the grunting was part of the package. My teacher Boris Pergamenschikov spent most of the three years I studied with him (1989–92) trying to teach me a more modern and generous way of playing the cello. But I still cherish the memory of playing Beethoven’s C major Cello Sonata for Norbert Brainin (the first violinist of the Amadeus Quartet) in 1990, and being told that I reminded him of Emanuel Feuermann—I obviously couldn’t and still can’t play like Feuermann (maybe in my dreams), but in any case he was referring more generally to my rather old-fashioned way of playing. Some years ago I recorded a programme of encores for EMI’s Debut series, a disc of Spanish encores. More recently I felt it was time to record another such disc, just for the fun of it. 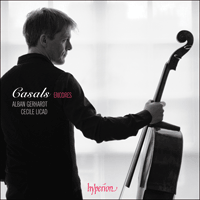 I had the idea to listen through to the five encore discs made by Pablo Casals, and choose those pieces I liked best for the recording, as a kind of homage to the cellist who first inspired me. Hyperion liked the idea, but the project stalled. The reason was, simply, that I was intimidated by the amount of work involved in finding the scores and preparing so many short pieces new to my repertoire, each of them needing loving care and attention. I would like to thank Susanne Hein, librarian of the Amerika-Gedenkbibliothek, for her assistance in tracking down some of the scores. I also needed to choose the right pianist—an artist of Cecile Licad’s authority not only evelates the quality of the performances, but also raises the music itself above the level of mere showpieces. While in a sonata you have time to tell the story of the piece in thirty minutes, in encores you have three minutes to say something of value. I certainly don’t try to imitate Casals, but I do follow his approach when playing pieces of this kind, treating them with the same care, intelligence, love and sensitivity as one would a newly discovered piece by Beethoven. Casals approached, say, the beautiful Romanze by MacDowell just as seriously as he would a movement of a Bach Suite. He played Bach differently from MacDowell, of course, but treated the music as being just as important. Although MacDowell and Popper are composers of lesser value than Bach and Beethoven, it is important to treat their works not as second-rate, cheap salon music, but with the sincerity and authenticity they deserve. Ma première idole a été le grand violoncelliste espagnol Pablo Casals. J’ai acheté tous les 45 tours sur lesquels je pouvais mettre la main et, pendant longtemps, j’ai voulu imiter sa sonorité unique. J’adorais l’articulation, l’intonation «d’interprétation» (jouant les tierces mineures très bas et les notes sensibles très haut, etc. ); même les grognements faisaient partie du programme. Mon professeur, Boris Pergamenschikov a passé la majeure partie des trois années au cours desquelles j’ai travaillé avec lui (1989–92) à tenter de m’enseigner une façon plus moderne et généreuse de jouer du violoncelle. Mais je chéris encore le souvenir d’avoir joué la Sonate pour violoncelle en ut majeur de Beethoven pour Norbert Brainin (premier violon du Quatuor Amadeus) en 1990 et de m’être entendu dire que je lui rappelais Emanuel Feuermann—évidemment je ne pouvais et je ne peux toujours pas jouer comme Feuermann (ou peut-être en rêve), mais en tout cas il faisait allusion d’une manière plus générale à mon style assez vieux jeu. Il y a quelques années, j’ai enregistré un programme de bis pour la série EMI’s Debut, un disque de bis espagnols. Plus récemment, j’ai pensé qu’il était temps d’enregistrer un autre disque de ce genre, juste pour m’amuser. J’ai eu l’idée d’écouter les cinq disques de bis enregistrés par Pablo Casals et j’ai choisi les morceaux que je préférais pour cet enregistrement, une sorte d’hommage au violoncelliste qui a été ma première source d’inspiration. Hyperion a apprécié cette idée, mais le projet a stagné pour la bonne raison que j’étais intimidé par la somme de travail que représentaient la recherche des partitions et la préparation de tant de petites pièces qui ne faisaient pas partie de mon répertoire, chacune requérant une attention affectueuse. Je souhaite remercier Susanne Hein, bibliothécaire de l’Amerika-Gedenkbibliothek, pour l’aide qu’elle m’a apportée dans la recherche de certaines partitions. Il me fallait aussi choisir le bon pianiste—une artiste aussi experte que Cecile Licad place non seulement la qualité des exécutions, mais aussi la musique elle-même au-dessus du niveau de simples morceaux classiques. Si dans une sonate, on a le temps de raconter l’histoire du morceau en trente minutes, dans les bis on dispose de trois minutes pour dire quelque chose de valeur. Je ne cherche certes pas à imiter Casals, mais je m’inscris vraiment dans son approche lorsque je joue des œuvres de ce genre, en les traitant avec la même attention, intelligence, amour et sensibilité qu’un morceau de Beethoven qu’on viendrait de redécouvrir. Casals abordait, par exemple, la magnifique Romanze de MacDowell tout aussi sérieusement qu’un mouvement d’une suite de Bach. Il jouait Bach différemment de MacDowell bien sûr, mais il traitait la musique comme si elle était tout aussi importante. Si MacDowell et Popper sont des compositeurs de moindre valeur que Bach et Beethoven, il est important de ne pas traiter leurs œuvres comme de la musique de salon de second ordre, mais avec la sincérité et l’authenticité qu’elles méritent. Mein erstes Idol war der große spanische Cellist Pablo Casals. Ich kaufte jede LP, die ich zu fassen kriegen konnte, und lange Zeit wollte ich seinen einzigartigen Klang nachempfinden. Ich liebte seine Eindringlichkeit, seine Artikulation und seine „interpretierende“ Intonation (er spielte die kleine Terz sehr tief, Leittöne sehr hoch usw. ); selbst sein Brummen gehörte dazu. Mein Lehrer Boris Pergamenschikov verbrachte die drei Jahre (1989–1992), in denen ich sein Schüler war, überwiegend damit, mir eine modernere und großzügigere Art des Cellospiels beizubringen. Dennoch denke ich immer noch gerne daran zurück, wie ich Norbert Brainin (dem ersten Geiger des Amadeus-Quartetts) Beethovens Cellosonate C-Dur vorspielte und er mir sagte, ich erinnere ihn an Emanuel Feuermann—natürlich spielte ich nicht so wie Feuermann und kann es auch nach wie vor nicht (so sehr ich es mir wünsche), doch jedenfalls meinte er damit meine recht altmodische Spielweise im Allgemeinen. Vor einigen Jahren nahm ich für die EMI-Reihe „Debut“ eine Auswahl von Zugaben auf, nämlich eine CD mit spanischen Zugaben. In jüngerer Zeit hatte ich das Gefühl, dass ich wieder einmal solch eine CD einspielen sollte, einfach aus Spaß. Ich hatte die Idee, mir Pablo Casals’ fünf Alben mit Zugaben der Reihe nach anzuhören und für meine Einspielung die Stücke auszuwählen, die mir am besten gefielen, quasi als Hommage an den Cellisten, der mich als erster begeisterte. Hyperion gefiel der Gedanke, doch das Projekt geriet ins Stocken. Der Grund dafür war schlicht, dass mir vor dem Aufwand graute, der damit verbunden war, die Noten aufzutreiben und so viele kurze Stücke einzustudieren, die neu in meinem Repertoire waren und von denen jedes viel Aufmerksamkeit und Hingabe verlangte. Bedanken möchte ich mich bei Susanne Hein, Bibliothekarin der Amerika-Gedenkbibliothek, für ihre Hilfe beim Auffinden mancher Notentexte. Ich musste außerdem den richtigen Pianisten finden—eine Künstlerin mit der Kompetenz von Cecile Licad steigert nicht nur die Qualität der Darbietung, sondern hebt auch die Musik selbst über das Niveau von bloßen Paradestücken. Während man bei einer Sonate Zeit hat, die Geschichte des Stücks in 30 Minuten zu erzählen, bleiben einem bei einer Zugabe gerade drei Minuten, um etwas Lohnendes zu sagen. Ganz sicher versuche ich nicht, Casals zu imitieren, aber ich folge beim Spielen von Stücken dieser Art seiner Herangehensweise, indem ich sie mit der gleichen Achtsamkeit, dem gleichen Verstand, der gleichen Hingabe und Sensibilität spiele wie man es bei einem neu entdeckten Stück von Beethoven täte. Casals geht etwa die wunderbare Romanze von MacDowell mit dem gleichen Ernst an wie einen Satz aus einer Bach-Suite. Natürlich spielte er Bach anders als MacDowell, aber er nahm die Musik genauso wichtig. Auch wenn MacDowell und Popper Komponisten von geringerem Rang als Bach und Beethoven sind, ist es wichtig, ihre Musik nicht als zweitklassige, billige Salonmusik zu behandeln, sondern mit dem Ernst und der Gewissenhaftigkeit, die sie verdienen.